Enjoy advanced features in a compact action camera. 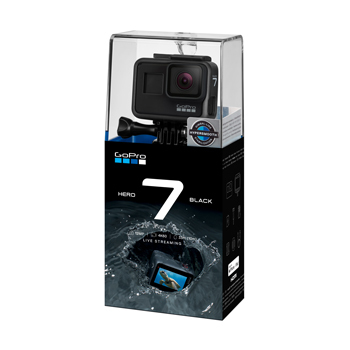 The Hero7 Black boasts HyperSmooth Video Stabilization, Waterproof design to 10 meters, voice and touch controls and much more! Never miss a moment again! GoPro has brought the action camera to the next level with the Hero 7 Black. Hypersmooth stabilization technology creates smooth footage without the need of a gimbal or mount. Pair this automatic shake correction with the rugged and waterproof nature (no housing necessary to 10 meters) of the Hero Black and you've got one of the most advanced action cameras out there. Simply speak and shoot with the voice control feature or swipe and select by using the 2" displays touch screen. SuperPhoto turns everyone into a pro! GoPro's SuperPhoto setting applies noise reduction, tone mapping and HDR to optimize the appearance of your photo. The SuperPhoto feature is important when snapping away in non-ideal conditions. 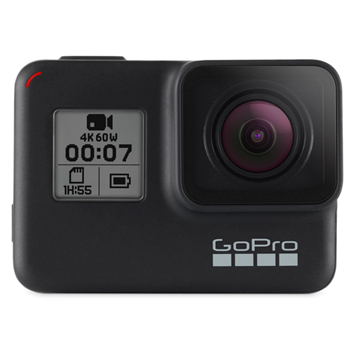 Whether you're capturing a child's athletic event on a dreary day, or photographing a wedding in harsh sunlight, you can be confident that your GoPro will bring out the best of your experience. Stream your experiences live and share your story to social media. Use the internal GPS to note your location so that you never forget where your experience took place. Never worry about deleting old videos to make room for new. Simply offload your footage to a microSD card. TimeWarp video is another feature of the Hero7 Black. Create time lapsed videos while in motion without the risk of shaky footage. Increase the speed to 30x to capture long duration events so you can relive your experiences! How's the quality? 4K60 video, 12MP photos and 8x Slo-Mo Video in ultra high frame rates of 1080p240 is just the beginning. Add 3-mic processing, stereo audio and raw audio capture and you've got crystal clear sound. A removable rechargeable lithium ion battery allows you to bring a backup on long excursions, never worrying about loss of battery impacting your ability to capture important moments. If you're looking for a full featured action camera, you have found your match. 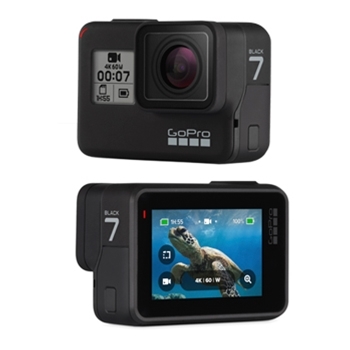 The GOPRO 7 Black boasts advanced technology, convenient size and intuitive design. GoPro Floaty Backdoor works with all GoPro Cameras. If you are using your GoPro on the water this is a must have accessory. GoPro Surf Mount Fits all HERO Cameras, Adds a tether to mount your HERO to a Surfboard, SUP, Kayak and anywhere your want an extra reinforcement. GoPro Rechargeable Battery for HERO 5, 6, and 7 Black Cameras. SanDisk Extreme 32GB microSDHC Class 30 with SD Adapter Blank. Reccomended for full 4K recording.